I am Mari Strydom living in Bultfontein, a small rural town in the heart of South Africa. I started to teach in my local community – teaching young women to quilt. My teaching quickly gained momentum, and soon I was teaching all over the Free State. Nowadays I am teaching different areas of expertise all over South Africa, various small Quilt Festivals and at the National Quilt Festivals. I am obsessed with quilting. I love spending time in my studio “playing” with fabrics, threads and designs. The colours and textures inspire my creative energies and make me happy. I am blessed with a talent for quilting and teaching. Quilting came into my life when I needed it most. The humbling experience – getting chemo - taught me that life is short and what effect creating something can have on you. I want to pass this on so that it can change other peoples lives as well. There is nothing that I would rather do! This is my true passion and joy. To all my fellow fabric lovers: I am blessed by your presence in my life. Established 4 quilt groups in Bultfontein. She has been in Education for 20 years being a Science facilitator for teachers in the Free State. She left education in 1999 and started her second job – Quilting in 2000 and teaching in 2004. Since then she has been teaching at guild, regional and national level. 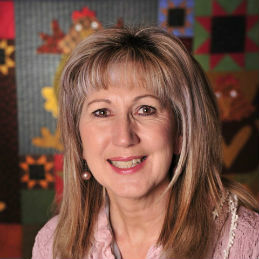 She entered numerous quilt competitions since 2001 - locally, nationally and abroad - and is an award winning quilt artist. In 2005 she opened her own quilt shop, Lappiesland, which broadened her horizon even further till she sold the shop in 2016 to allow her more time for teaching and judging. She has done various commission quilts for private institutions and has also sold quilts to private art collectors. Mari Strydom is a full time quilt artist and teacher whose work reflects her passion for colour and texture. A teacher and scientist by degree and outgoing by nature she excels in teaching. She started teaching in 2004 and has been teaching ever since for the past 14 years.